For some reason there were 6 kids in after school with me…all working on different topics and courses. Yikes. I had to be on my toes that day. One student in particular was working with polynomial operations. Why do we add the exponents on these… but not these…? Well. I paused. Why do we? That expert blind spot…I know that’s what we do, but why? We aren’t actually adding exponents but that’s what appears to be happening. Help. Hmm. Well. Uhm. Flashback to my daughter’s 2nd or 3rd grade math. Too often students see polynomial expressions as some obscure thing. Have we failed them by not encouraging them to see them as numbers? 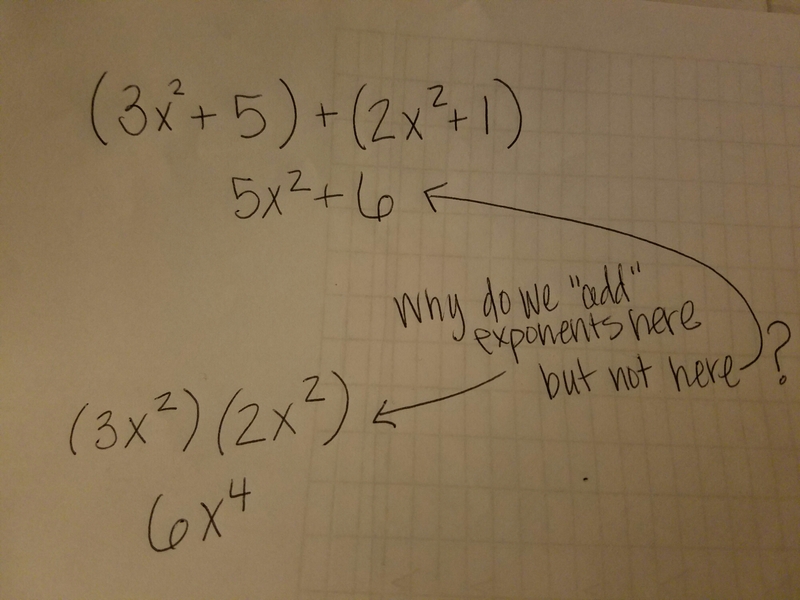 Please share how you address this same question, why do we add exponents here, but not here? We did not get through all I intended today to allow some students who wanted to watch the inauguration that opportunity. But we did address a couple of more questions from the 2-minute reflection students had completed. You can look back to the previous post to see the original task. We addressed the two blue questions in the after lunch class. Why can’t you multiply the numbers by each other? Well, lets see. Again, as I did with another class, I asked them to add two numbers that would give us 18. We graphed our responses, then graphed the equations x+y=18. And likewise, give me two numbers that would multiply to give us 18. We graphed our responses along with xy=18. When we added the equation to the product set, students were caught off guard with what they saw. WHY is there a graph in the third quadrant? Will that red curve ever cross the y-axis? Doesn’t it eventually get to the axis? Again, just attempting to address their question, by looking at a couple of horizontal translations and introducing them to that boundary line called an asymptote, led to even more wonderings. Which is what math class should be about. As long as they were on task, I continued to go with their questions. Only 3 students were not interested, who would likely have been off task no matter what I chose to do, so I made the decision to keep going with the majority’s curiosities. Another student asked about our statement “x cannot be in the denominator” but yet when we find rate of change with a table of values, we compare y over x. Hmmmm. Good question. So I gave a table of values, asked the student to talk me through finding rate of change. When we wrote our ratios, what values did we use? Not the actual y and x values, but the change in y over the change in x. The entire class really reminded me that we can say something with an intent, but what our students hear is something else…how important communication is, how important is it that we allow some time to process and clarify their misunderstandings. Finally, we addressed the question, we’ve been told x’s exponent must be 1 in the linear function. We’ve seen greater than 1, but if it is less than 1, can it still be linear? Let’s see. Go to y=, type in x and choose an exponent less than 1. What do you see. Share with your neighbors. So, how would you respond to this question, students? To me, this was one of the most productive two days I’ve had in this class. Students were engaged because we were addressing their questions. I’m not sure I actually answered their questions, but I provided them with some examples that allowed them to answer their own questions. Linear Functions Organizer this does not include arithmetic sequences, which was earlier in the year, but I can refer back to our work with them to activate prior knowledge for this unit. The next unit will be linear regression which will include correlation, describing scatterplots, finding regression equation with technology, using the equation to predict and finally introduction to residuals. Students started with a pre-quiz similar to the one below. Identify Linear Functions This is a booklet with a Frayer Model for our notes, a variety of math relations to identify as linear or not and a 2-minute reflection grid on the back. Prior to beginning our notes, I gave them 1 minute to jot down anything they thought they knew about linear functions. Then we pair-shared before sharing with the entire class. Then we took our notes. (as a follow up the next day, I gave them 2 minutes to jot down all they could remember about linear functions as a small retrieval practice). Our next task was created by cutting apart these relations and posting them around the room with a chart that asked if they agreed or disagreed with the example being a linear function. Students received stickers to place on the chart as they visited each station. I was fairly accurate in which ones I thought we’d have to use for discussion, but a couple really surprised me. These are the 4 we discussed following the carousel activity. I. y = 2x was the one I was not expecting. When I asked if someone would share their thinking, one student said they thought x was an exponent. Another shared they did see “the b” for y-intercept. We looked at a table of values and graph to agree, and show the y-intercept was at the origin and indeed y = 2x was linear. The other I failed to snap a picture of was graph K, a vertical line. Yes, it’s linear, but not a function…two students got that one correct in this particular class. On the reflection grid, if they have no questions, nothing is confusing, I ask them to give me a caution…something to be careful or / watch for. Several of these questions encompass multiple students. Some of them I only needed to clarify what was said. Its pretty clear I was not communicating very well on a few of the. I hear my “expert blind spot” showing up…”Of course squared is not linear, we learned it was quadratic in our functions unit!” But so many students on the pre-quiz used vertical line test as their reasoning for linear…we had some side conversations about this misconception…that it shows functions, but does not prove if its linear. Some of the questions, I allowed other students explain their reasoning to help clarify their understanding. Why can’t you multiply the numbers by each other? We tried it. Add 2 numbers that will make 18. Create table of values, find rate of change, graph it. Yep, that’s linear! Multiply 2 numbers that will result in 18. We created a table of values of their answers, found the rate of change and graphed them. No, that’s not linear! If an exponent is less than 1, can it be linear? We will try it tomorrow as our bell ringer. But I look forward to exploring their questions more! I told them how excited I was about their questions and posted them on our “THINKING is not driven by answers, but by QUESTIONS” board. One student had the biggest smile and as she said, Look! I’m so proud, my question is on the board! Something so simple, yet, my hopes are that it will encourage her to ask more questions. I grabbed a Monster Truck from my box and asked students to brainstorm all the questions they could ask about the truck. Pair-Share their questions, then choose one to share with the entire class. Anyone have any other questions not on the list, you’d like to add? Every time, someone wonders how fast it will go. I’ve use Chris Shore’s lesson Monster Cars for several years in Algebra I, but this was the first year I used a video to hook students as I introduced the lesson. What does this have to do with Math Class?!? I can’t wait to continue the lesson next week! Its grabs their attention a bit more than a typical textbook lesson. I have good intentions of hitting the ground running add term Christmas Break. A day out for a water line break and our first snowday baffles those plans. Today I had students finishing the MAP test, others doing wrong answer analysis on their midterms, others recising their NTI assignments and a group who had completed all. The latter group, I circled up some desks, said move over here, bring a pencil and gave them packets from Balance Benders! My instructions… these shapes represent quantities. See of you can figure them out. There ended up being 6 students in that circle, but it was fine. Good discussion, critiquing rhe reasoning of others, checking their own work. Wow. Excited discussion. I need to locate my level 3, these kids will be ready for it soon! But the post below…needs an update. Later that year, the student emailed me to let me know they had completed their credits and graduated. In the Spring 2016, their sibling let me know they moved to Alabama before they would leave for Basic Training in the Air Force last that year. Just before midterms week last semester, I received a phone call – from the front office asking if I was available to meet with a visitor. This young man stopped by to see myself and a colleague. They were home for a while before transferring to their new assignment. Here’s what made me most proud. They were in fatigues (I apologize if that’s not the correct wording), standing proud. But when jROTC students walked by, shook his hand, saluted him and thanked him for his service. I couldn’t help but tear up because the respect this young person had always deserved was given to him. I was so proud for him – that these young minds saw him as a leader. Everyone in the classroom has different things that drive them. I always wanted to be a teacher so I could help students understand math. When my daughter started school, my viewpoint changed because she’s an out of the box thinker, creative and loves music. I wanted students to see connections and the bigger picture and the beauty beyond the procedures. I wanted them to feel challenged but also heard when they saw things differently. Its hard breaking the traditional mold I was raised on in math class. Just because I have different goals as a teacher does not make me better, nor inferior to other teachers. Just because I’m not up to par on the latest and greatest classroom craze does not mean I’m inadequate. I attempt to be the teacher I want my own daughter to have. As teachers we have somebody’s child sitting before us. I want their time to be purposeful and challenging. I want them to leave my classroom with a tired brain, but a smile on their face because of what they accomplished. I want to be the best version of me because I want my daughter’s teachers to be the best version of themselves for her. How do I know what to change? How to change it? How do I know it will impact their learning? Will that impact be a positive one? That’s another post, on another day. Its obvious each new class has different needs, prior knowledge/experiences and varied levels of effort. Before MTBOS, I’d find articles, often from NCTM MT that helped me ponder ways to present topics differently. Conferences were often a well of great ideas I could take back to my classroom. But how do I decide what to use? How do I know what will work? Its often been trial and error. Try it. Reflect. Adjust. Try it again until it feels right and gets the results I’m looking for. Action research at its best, right in the middle of my classroom. 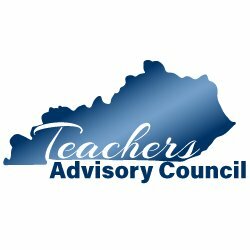 What works for one group of students is not guaranteed to work for another group. And that’s okay. What works for one teacher may not work for another teacher’s style. And that’s okay too. I love #MTBOS because its a safe spot for me to be me, imperfect, not knowing how to do something… I am allowed to ask questions, offer ideas without fear – because I value the opinions of those I interact with. They help me learn, our conversations allow me to process ideas and come up with ways of accomplishing the challenge before me. They don’t judge me for not knowing something or how to do a certain thing. Or if they do, I’ll never know it – and that’s okay. When I make a statement that’s incorrect, its not the only time they offer me feedback – just to prove I’m wrong or made a mistake – they offer me feedback whether its good/bad/ugly. I’m allowed to be vulnerable, not have all the right answers. Its the safest learning environment I know for me. I can brainstorm, be creative, offer off the wall answers. I am challenged to think, held accountable by peers and encouraged to ask questions of which I don’t know the answer to. I leave with my brain hurting, and a smile on my face. Its available 24/7/365 whenever I choose to visit, whenever I need to visit. Its how I envision my own classroom being…when I finally get it right. I’m not sure that my use of attend to precision is quite what SMP6 has in mind, but there was some interesting discussions in class yesterday. As we ran out of time on a previous day, I had students jot down their measurements for their group’s cups on a post-it before they left. And I had an issue with some of their information. Either their measuring was incorrect or their calculations were wrong. Didn’t matter which one really, I mean, it’s only math class. Right? Not like there is brain surgery going on or anything. Most of the jibberish below will make no sense unless you were in class at that point in time. I wish I’d kept a clean copy of their information and created a new slide with each new comment made. The info is numbered with 1 through 7 if you can make that out in bottom corners of each box. We looked at the amount each group missed their mark. Somewhere you’ll see a +3, +1, +1, +16, -0.8, ,+44. We guess group 6 mis-measured. But not sure what happened with group 7… Here’s where it became a little interesting…groups 3 and 4 appeared to be wrong by the same amount, but a student brought up… one group was off 1 cm from 15 cm and the other was off 1 cm from 18 cm. “What are you saying?” Group 3 has a bigger error than Group 4. Pause. It was suggested we look at error compared to what the height should have been. And so we did. Group 7 caused some issue…can they be 290% wrong? Hmmmm. What do you think? What does that mean? One student said, they don’t get a second chance…they’re outta here. Lastly, we took a look at error. One group submitted a rim measure of 1 cm when it should have actually been .6 cm. They were over .4 cm. Big deal, right? It’s a little less than half a pinky width. That’s not enough wasted material to get fired,right? What if you had a stack of 10 cups? 50 cups? Not likely gonna get you fired. But what about 500,000 cups? That’s 200,000 cm too much. CM are small, so not a big deal. Wait. 78,oooish inches, 6,561ish feet, 1.24ish miles. 1.24 miles of wasted material may get you fired. Anyway, the size of the error is relative. It was a nice little discussion of how not being precise in our measurements may grow to an outlandish error is a larger context…outside of math class. I like big cups, I cannot lie. I’ve been stacking cups since…uh. I think my first NCTM Navigating Through… book was around 2002 or so. Its been a while. I have vivid memories of discussions in classes from room 125. Yep. It’s been while. Long before there were songs about Solo cups. My guess, a few of my sets of cups may be that old. They’re a cheap resource. Find a buddy or two, each buy some different sizes, split them up and you’ve got some varied sets of cups. Hmmmm. What all can you do with cups? I. This past week, I began by displaying a single cup and asking students to generate as many questions as they can about said cup. Set the timer. II. Turn to your groups and share your questions. Then say whether it was mathematical in nature or not. Each group shares out 1 question with the whole class. Then if anyone had a question they wanted to share that had not been included. Yes, we actually looked at the etymology of cup…wondering where the name originated. III. a. I went with “Why am I stacking cups?” as my transition to the task. You guys are engineers today. Packaging designers, specifically. Design a box to ship a stack of 50 cups. They needed tools, so I gave each group 4 – 7 cups (did I mention some of these cups may actually be older than some students? ), each group with a different size/brand of cup and a measuring device. Set the timer 5-7 minutes depending on class. I need some help. One group has a stack of 5 cups measuring 14 cm, and their height for a stack of 50 cups would be 140 cm. Do you agree or disagree with their response? Turn to your group and discuss. Set the timer. I have some varied responses usually. When I get to someone who disagrees, I ask how tall they think the box should be and they come to the board to explain their reasoning. III. c. Yes, believe. You will sometimes have a class where no one disagrees with the 140 cm response. Have them to create a table of values to record their measures for 1 cup, 2 cups, 3 cups, etc. Set timer. Usually during this time you will hear the a-ha’s. Bring the class back together to discuss / share their thinking. Modeling how the cups would be stacked. Okay, so moving on now. IV. Once we feel fairly confident in our expressions. I ask them to find the height of a stack of ____ cups for their group. V. Well, what if I had a box that was 80 cm tall, what is the largest amount of cups could I ship in that box? VI. At that point, we share our expressions we’ve created for each type of cup. I put all cups on display and ask groups if they can match the cup with its expression for total height (cm). This leads to some light bulb moments for a few students. They can now see how different parts of the expression represents different physical parts of the cup. I always thought it would be fun to list the expressions on cards and they have to match to the cups and play the Race Game from The Price is Right. how many cups to make a stack of 80 cm? What’s one take-a-way from today’s task? How are the expressions alike? different? Which two expressions are most alike? Explain. Which two are most different? Explain. Next, have students compare their cup stack to another groups stack of cups. When will the two stacks be equal heights? Just using my groups’ expressions above, they get at least 6 practice problems. You can leave it as an open task – students can choose tables of values, creating equations to solve or even solve graphically. The key component is to ensure they interpret their solutions (x, y) = (cups, stack height) within the context of the scenario.